DataLoad spreadsheets and loads may be protected to prevent them being changed. This is particularly useful where a load is shared between a number of users and the load's author wants to ensure the users don't make any changes to the load. All Protection settings are controlled from the Protect Load form, which can be opened by selecting "Protect Load" from the "Tools" menu. That will open the window shown below. The Protect Load window has a scrollable list of DataLoad functions, each of which has a checkbox that enables the function to be enabled or disabled. By default all functionality is enabled but functions can be turned off by un-checking the relevant checkboxes. All checkboxes may be ticked or un-ticked by using the checkbox beneath the scrollable list. The DataLoad functions are divided in to four groups. First are the "DataLoad Options" and this includes functionality that affects the whole of DataLoad. The next three groups contain options specific to spreadsheet behaviour and there is one group per spreadsheet, that is header, main and footer. These options control what the user can do within the spreadsheets, such as inserting and deleting rows, columns and comments, importing data and sorting rows. The Dynamic Rows and Dynamic Columns options control how DataLoad manages the size of the spreadsheets. By default, a spreadsheet's columns and rows automatically grow when data is added. This dynamic behaviour ensures there are always additional columns and rows available. However, sometimes it is useful to fix the number of columns or rows. For example, it may be appropriate to fix the number of columns and delete the unused columns so that a spreadsheet only contains the columns that users need to populate. If functionality is turned off then a password should be set to prevent unauthorised users from re-enabling these functions. That can be achieved by entering a password in the password box. Having set protection options and a password one further change is recommended to ensure unauthorised users cannot change the load. The load should be saved in Dataload's encrypted file format (.dldx file extension). That file format scrambles all data and settings so they cannot be changed by editing the file directly. 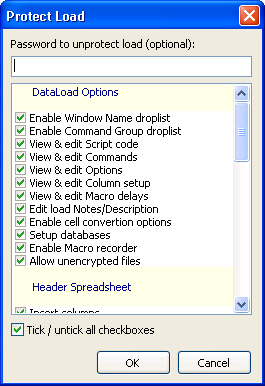 To encrypt a file select "Save As..." from the "File" menu and select the "Encrypted DataLoad File(.dldx)" file type.